6 Houses from City Beach - the Doctors' Inn! This spacious house has almost always been the home of a doctor, beginning with Dr Dwyer in the 1920's, Dr Carlson in the 1940's, and Dr Don and Dr Jane Gumprecht in 1951. The Gumprecht children, three of whom are themselves doctors, now offer this gracious accommodation for your vacation enjoyment. 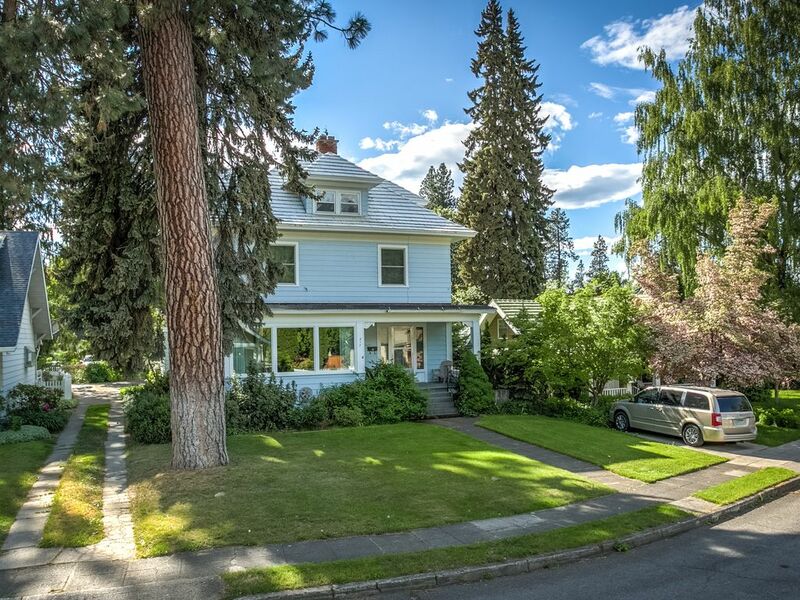 Situated in the historic, peaceful Fort Grounds Neighborhood, it is right in the middle of all that makes Coeur d'Alene famous. The neighborhood was born before the automobile, when everyone walked. It remains within easy walking distance of most everything. Confirm this by doing a map search of Military Drive. Then review the web sites of the CDA Visitors Bureau and the nearby Coeur d'Alene Resort for a complete run down of the area's attractions, close in and farther out, summer and winter. If you can tolerate purple prose, read VRBO listing #185852 for further descriptions of neighborhood history. The Doctors' Inn has been refurbished with one new and one renovated bathroom (the half bath retains its 1957 pink glory). The kitchen appliances are new. There are now 3 cable TV's, Broadband, a game room with foosball, Wii, board games, cards, toys, and the like. Sleeping space is ample and we are pleased with the preparations made to accommodate families with small children. We intend for everyone to have a vacation of cherished memories. Dr Donald M. Gumprecht and Dr Jane Gumprecht purchased this house in 1951 and raised a family of four: Donald George, Ruth, Tom, and Ernest. The boys went on to become physicians and Ruth's daughter, Heather, is a physician as well. Interestingly, two prior doctors had owned the house earlier in the 20th century also. In order to keep the house in the family and preserve it for family gatherings, the Gumprecht children have decided to offer it for vacation rental. As such, it is suitable for use by other parties with similar needs, particularly families with children. Many small Gumprecht feet have padded their way to the beach, the park, and downtown. The city of Coeur d'Alene grew next to Fort Sherman out of which eventually was subdivided the Fort Grounds neighborhood. This explains why the location of the Doctors' Inn is so close to all of the attractions that make Coeur d'Alend famous: the beach, the park, excursion boat rides, downtown shops and eateries to name a few. Of necessity everything was within walking distance in the early days and it remains so today. 6 bedrooms sleep 11 with 3 tv's a basement game room (tv, wii, foosball, airhockey board games, cards, toys). An ample dining room with large table, good-sized tv room, large living room, sun room with tv, proximity to the Coeur d'Alene Resort, all of the downtown and waterfront activities. So much history in the house, it felt as though you stepped back in time. For those who wish a very quiet and meditative experience, this is the place for you. Thank you so much for your kind words. We are glad you enjoyed The Doctors' Inn. Come again! We needed a home to stay in for our daughter's wedding. The Doctor's home was perfect. We had 9 of us and the home gave us so much room and just the feel of the home was so special. Even the bridal party came and got ready for the wedding and the front room could not have been more perfect. The neighborhood was beautiful and Fort Sherman park was so close that the grandkids could go often to play. We truly enjoyed our stay and look forward to returning one day. Thank you for your kind words. I hope you come back for another stay at The Doctors’ Inn! Great location and has so many amenities! Enough rooms for our extended family. Very comfy and cozy, like Grandma’s house. We have come back for a couple years now. Thank you so much for your kind words. Please keep visiting The Doctors Inn! Great location, house was good. Room for everyone. We have been to Coeur de Alene before and love it. So many things to do there. As for the house, fantastic location. We were not able to us the bedroom on the 3rd floor because it was to warm, no air conditioning. The house itself was great. Great memories were made at this home. Such a delightfully warm home full of history and memories. So peaceful and welcoming. This was my 4th visit to Coeur d’Alene. This house caught my eye during my trip to the Ironman in August 2017. How lucky and surprised was I when I arrived home and discovered it was a vacation property!! The home far exceeded my expectations. Even with the enormity of the home, it was warm, comfortable, charming, peaceful and most of all, quiet. I felt like I transformed back in time and became a part of the Gumprecht family. Seeing all of the family heirlooms, photos and memories told a story of a very kind and loving family. Every corner of the home offered something special. The location could not have been more perfect. The rental car served the purpose of airport transport and a couple of grocery store trips, otherwise, we were able to walk comfortably everywhere we wanted to go. I once again left Coeur d’Alene wishing I could live there. The community is full of kind and wonderful people. It is a VERY dog friendly town, I enjoyed my visits with dogs in many of the local shops. Roni Young was so great to work with. Extremely responsive and accommodating both before and during my stay. If you have the opportunity to visit Coeur d’Alene, I strongly recommend it!! A stay at the Doctor’s Inn should be included in your itinerary. Thank you to the Gumprecht family for sharing your beautiful home with us.